I keep meaning to finish writing about TI, I really do. I love “Paper Trail” and am eagerly waiting for TI's next album, which I figure he must have been working on while he was in jail for weapon possession. My sons and I listen to his CD a lot in the car, and our shared love for, and frequent conversations about, the same singer/song-writer might have made a nice topic for a Valentine's Day post. But I've been seeing a lot of movies lately, what with the endless snow, lack of school and all, and have been thinking about men, movies and the upcoming Academy Awards (March 7). Last night, my husband and I saw "Percy Jackson and the Olympians: The Lightning Thief" with our nine-year old, two of our nephews and our niece-in-law. (I would have preferred to see “Precious” or “Crazy Heart” but we had two seven-year olds with us.) “Percy Jackson” was good enough---the kids liked it, and yours will too, especially if they have read the Rick Riordan series, which our younger son has not been able to put down (and this is saying a lot, because he is a bit of a screen-addict and the fact that he has finished three books in four weeks is a credit to Rick Riordan’s story-telling abilities.) Pierce Brosnan stars in "Percy Jackson," and though this is a far cry from his role as James Bond, he's still charming. The movie is not fantastic, but Brosnan is a pleasure to watch. He's muscular and bearded and seems cheerful about being almost unrecognizable as Percy’s mentor, Mr. Brunner, aka Chiron the Centaur. Brosnan morphs from a scholarly, wheel-chair bound teacher into a half-man, half-horse. He struts around on four hooves and the transformation actually works. Steve Coogan (who is as funny and self-mocking here as he was as "Octavius" in "Night at the Museum") is delightfully diabolical as Hades. He is married to Rosario Dawson, who plays Persephone as a lusty bombell with a thing for teenage boys. Miserably domesticated in Hell, the two still give off heat, and Coogan gives the movie the slight edge it has. A couple of days ago, my younger son accompanied me to see, "Dear John." This wasn't his first choice, but he is still young enough to go see love stories with me, especially if I promise to buy him a Coke first. Channing Tatum stars as "John" in "Dear John" and is one of the best-looking young men I have seen on the silver screen. This movie had me on the edge of my seat for the first half, as "John" and "Savannah" (Amanda Seyfried) get to know each other on the coast of South Carolina. Tatum is a reticent, gorgeous, motherless son, whose father is autistic. He's on leave from the Special Forces,and while he's getting some R& R, he surfs, walks around without his shirt on, gets into fights and rescues Savannah's purse when it falls into the sea. Then they fall in love. I don't think Amanda Seyfried is much of an actress, but you can see why Tatum's character becomes besotted with her and there is something delicious about watching two twentysomethings kiss, fight and make up near water. Richard Jenkins, in his small roll as Tatum's father, is painful and wonderful to watch. He has an anxiety attack in the back of a car and refuses to finish the ride to meet Savannah's parents. The scene is wrenching. The second half of the movie falls apart---Tatum goes off to war in Afghanistan, Africa or Iraq (it's hard to tell where and the movie keeps it vague), and he and Savannah write long letters to each other. When John comes home, things have changed---Savannah has moved on, and he hasn’t. But he goes to find her in his uniform, does something selfless and virtuous, and she finds him hard to resist. Who wouldn't? If I sound like I'm swooning, forgive me. Tatum's shoulders are broad, his eyes are doleful, his abs are carved, his muscles are big, and the muscle in his right cheek twitches ever so slightly when he's upset (which is often). I can't say I've ever seen a muscle act before but in this movie, it does. For two hours, I actually believed that I was watching a young soldier falling in love and growing up in the process. I saw Channing in "Stop-Loss," where he also played a modern soldier. But his character here is more appealing. And better looking. Talking about better-looking, I have been meaning to write about "Up in the Air." This is not an Oscar-caliber movie, and yet here it is, being nominated for "Best Picture." I have to admit I do love to look at George Clooney, and he is funny and endearing in this movie, but the real star of the film is Vera Farmiga (and not just because she grew up in New Jersey.) She and George Clooney have a fling and I’m not spoiling anything by saying it doesn’t end well for Clooney’s character, “Ryan.” "Up in the Air" violates the fundamental principle of storytelling: Something has to change. As the hero goes on his or her journey, s/he has to progress or regress. But there’s no progression or regression here. George/Ryan starts out single, wistful, lonely and handsome, a frequent flier preoccupied with gaining more miles, and at the end of the movie, he's still in exactly the same place. The storyline is flat. The real story belongs to Vera Farmiga’s character, "Alex." Alex is also a wry, lonely, obsessed frequent flier, except for the extensive periods of her life when she's not. Among other things, she’s married and has everything to lose. Someone should make a movie about her because by the end of the movie, I was concerned about how Alex was going to continue the delicate balancing act she has going. George Clooney flies away and I was glad to see him go. I love "30 Rock" but that's not the only reason I loved Alec Baldwin as "Jake Adler" in "It's Complicated." 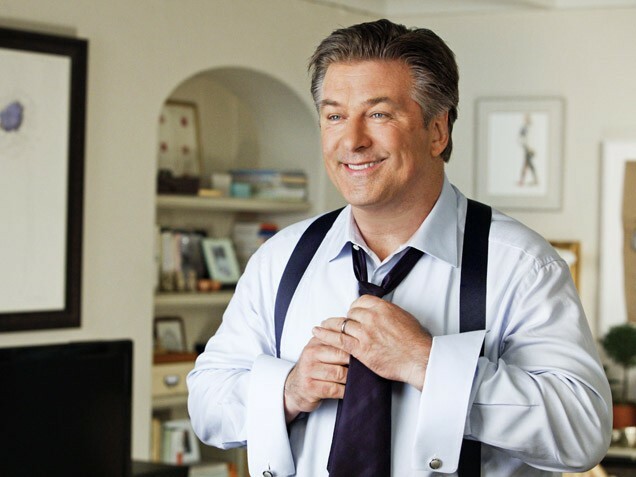 Unlike George Clooney, Alec Baldwin doesn't seem particularly vain or self-conscious as a messed-up, middle-aged man. Lucky him: He gets to marry "Jane" (Meryl Streep, gorgeous and blonde at 60), have three kids with her, leave her for a much younger woman, and then sleep with her again. Jake is a bit of a narcissistic cad, but what can you do? Meryl Streep’s character sees right through him and takes him back anyway. At least Baldwin's character has the good grace to articulate the massive regret he has for leaving Streep in the first place. I'm not ruining anything here by saying that "Jake" ends up worse off, and "Jane" ends up just dandy, thank you. Baldwin's performance is moving and poignant---you really feel as if he wishes he hadn't dumped the mother of his children for the young hottie he gets stuck with. And when he bares his fat, furry stomach for Jane after many years away, it's appalling but real. Baldwin should get an Academy Award for chutzpah. Since this is Valentine’s day, I have to write about love. Valentine's Day was also my father's birthday; he would have been 71. Happy Birthday, Dad, wherever you are. Below is a recipe I promised to send to a long-time reader of this blog. It's the kind of dish you make for people you love; it's fattening and delicious and leads to many sighs of pleasure. Plus, all that cream and wine means it works just as well on scallops that have been in your freezer for a month as it does on scallops that have just been picked up at the fish market, and you have to love that. Even picky eaters like my younger son and my stepfather love this. Happy V-Day, y'all. Put 4 tablespoons butter in saute pan over medium high heat. When foam subsides, add scallops, and sprinkle with salt and pepper. Brown scallops on both sides; they do not have to cook through, Remove them to a plate. Turn heat down to medium and add remaining two tablespoons of butter. When it melts, add shallots, garlic, chili flakes and a little more salt and pepper. Cook about two minutes. Add wine, raise heat and let mixture bubble for a minute or so until it reduces by half. Then add cream and reduce. When the liquid is thick, add the scallops back to the pan. Cook for about a minute, then add basil. Adjust seasonings and serve.